Najla Al Ansari, Project Lead of Sharjah Entrepreneurship Festival, Najla Al-Midfa, General Manager at Sheraa, Hadi Badri, Chief Strategy Officer of Emaar and Shihab Al Hammadi, Director of Shams at the launch. Driven by a mission to “celebrate and recharge the spirit of entrepreneurship” among the UAE’s entrepreneurial community, Sharjah Entrepreneurship Center (Sheraa) is organizing the maiden edition of the Sharjah Entrepreneurship Festival (SharjahEF) on November 21-22, 2017 at the Sharjah Golf and Shooting Club. As a festival bringing together the best of the UAE's entrepreneurial ecosystem, SharjahEF expects to provide a platform for local and global entrepreneurs, investors, and others to explore and collaborate for their ventures. Launching the event at a press conference in Sharjah on Sunday, the organizer Sheraa said that SharjahEF would host entrepreneurs, government partners, investors and industry veterans, expects to welcome over 1500 attendees for two days of conversations and workshops, and will see 60 regional startups showcasing at Startup Town (a exhibitor event providing exposure to the ecosystem). Not just that, selected startups from those applying to showcase at the festival also get an opportunity to pitch their businesses to a jury panel for a chance to win up to AED150,000. They can also benefit from the guidance offered in the one-on-one mentoring sessions and discussions that are on the event’s agenda. Moreover, SharjahEF goes beyond the talks, panels, and workshops and has lined up entertainment activities to help entrepreneurs relax. According to a statement, Najla Al-Midfa, General Manager at Sheraa said, “Launching the inaugural edition of the Sharjah Entrepreneurship Festival is just one of the many ways Sharjah’s entrepreneurial ecosystem is coming together to fuel not just established startups but also aspiring entrepreneurs. This two-day celebration of entrepreneurship aims to inspire new achievements, generate thought-provoking discussions, and rejuvenate the ecosystem's spirit and passion for building a better future.” She added that the event’s mission is to support the growth of local companies from the UAE, in the long-term. 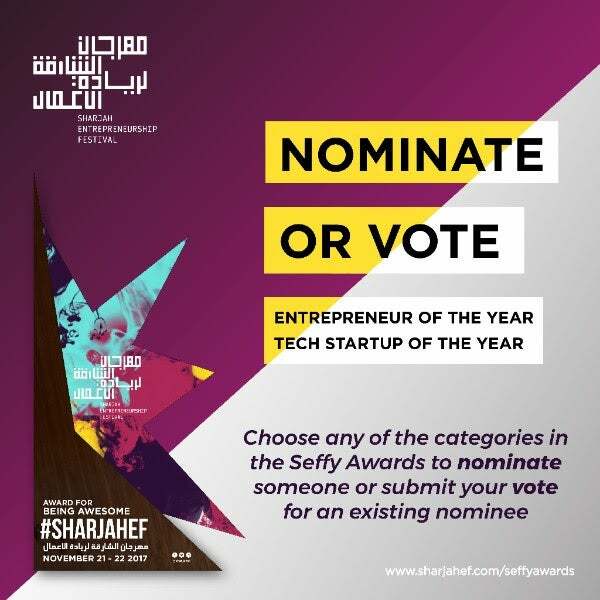 SharjahEF also wants to recognize the merit in the UAE's startup industry by introducing The Seffy Awards. Under the patronage of H.E. Sheikha Bodour Al Qassimi, the set of nine awards recognize UAE-based entrepreneurs in various categories including Entrepreneur of the Year, Tech Startup of the Year, and the Sheraa Rising Star of the Year, among others. With Emaar and Sharjah Media City (Shams) as its strategic partners, the debut edition of SharjahEF has also managed to seal a line-up of 80+ speakers, that include some of the most renowned voices from the region’s business community such as Mohamed Alabbar, Chairman, Emaar Properties, Fadi Ghandour, Executive Chairman, Wamda Capital, Arif Naqvi, CEO, The Abraaj Group, Joy Ajlouny, co-founder, Fetchr, and Elissa Freiha, founder, WOMENA, among others. To secure your spot to the event and/or to apply to showcase your venture visit SharjahEF’s official page.